PROMOTED: Hands on with the Philips NC1 noise-cancelling headphones | What Hi-Fi? As well as the headphones themselves, of course, you get a hard carry-case (which could prove handy if you’re in the habit of stuffing your cans in your bag when travelling), a 1.2m fabric-covered audio cable, a 1m micro-USB cable for charging, and a dual-pin airline adapter for connecting to airline entertainment systems. What are the headphones like? The NC1s also feature details such as numbers on the adjustable sliders, so you can keep each side even, and 90-degree plugs on the cable to keep things more discreet. There’s also an inline remote control and microphone for controlling your music and making and receiving phone calls on the move. The pads on the double-layered ear shells are made of memory foam and breathable materials, all of which aim to let you wear the NC1s for long periods (such as a long-haul flight) without your ears getting squashed or too hot. There’s a soft rubber lining on the headband to keep your head comfy, too. In use the NC1s feature active noise-cancellation (ANC) to block ambient sound. They use four microphones to detect ambient noise, and then invert that signal to cancel it out and convert it to silence. It means constant drones like aeroplane engines and train noise are all but eliminated, while speech and other transient sounds are greatly reduced. The effect can be switched on or off depending on your circumstances. The headphones are powered by an internal battery, charged via the USB socket. And unlike many noise-cancelling cans, the NC1s still function as normal headphones if the battery runs out – so you won’t be without your music for the rest of that flight. There’s a low-battery warning for when juice is running out, but you’ll get up to 30 hours of noise-cancellation from a single charge before that happens. 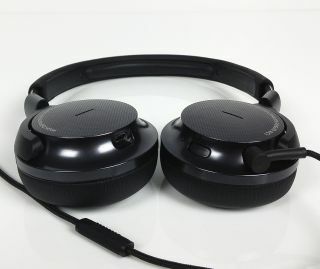 For more information about the Philips NC1 active noise-cancelling headphones, visit www.philips.co.uk. Philips also launched a variety of other products at this year’s massive Consumer Electronics Show in Las Vegas. Find out more here.